Activated charcoal is everywhere these days, even in toothpaste. If you listen to bloggers and other influencers on the internet, they’ll tell you that activated charcoal is said to be a good natural alternative to peroxide for whitening the teeth. The black powder is thought to absorb and remove stains caused by foods like red wine, coffee and tea. The buzzy ingredient, which is typically made from either bone char, coconut shells, peat, petroleum coke, coal, olive pits or sawdust, according to Healthline, is known for its abilities to absorb dirt and impurities. It’s kind of like a magnet that attracts toxins, which is why it’s used in water filtration systems and to treat drug overdoses and food poisoning. So that would also work for your teeth, right? Well, not so fast. We talked to dentists to see what they thought about it, and they’re not convinced. “Activated charcoal can have many health benefits due to its ability to remove harmful toxins from the body,” Dr. Nicole Khalife, a New York-based dentist, told HuffPost via email. But she added that individuals should consider a few things before they try using charcoal to whiten their teeth. First, she said, if you do use it, you should make sure the powder is extra fine, so it’s not too harsh on your teeth. Second, you should definitely not use it daily. She recommended once a month, if you must, because of its abrasiveness. “There has not been a single study done that shows that using charcoal products for oral health care does anything good for your teeth at all,” he said. Both Chase and Khalife agreed that the abrasiveness of the charcoal can actually have the reverse effect on people’s teeth. The potentially harmful effects of activated charcoal don’t stop at the enamel. Chase and Khalife explained that a loss of enamel can lead to increased sensitivity and increased susceptibility to dental decay. 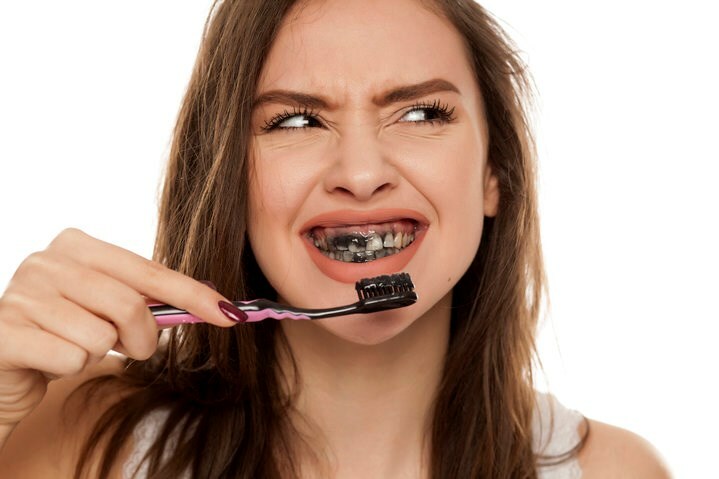 If that’s not enough to make you wary about scrubbing your teeth with activated charcoal, it’s important to note that the American Dental Association hasn’t given charcoal its Seal of Acceptance. Last year, an article in the Journal of the American Dental Association concluded that there’s “insufficient clinical and laboratory data to substantiate the safety and efficacy claims of charcoal and charcoal-based dentifrices.” The article also stated that more studies need to be done to prove whether charcoal is really safe for oral care. “The best way to remove deep-seated yellowing of the teeth is with professional whitening,” Khalife said, explaining that in-office whitening usually takes about an hour to an hour and a half and provides immediate results, while at-home whitening is usually done over a period of one or two weeks. “Personally, I prefer custom whitening trays due to less sensitivity afterwards,” she said. When it comes to trying out fads, whether it be activated charcoal or even rubbing strawberries on your teeth, Chase admitted it’s great that people want to learn about ways to take care of their teeth, but advised that they might not work, or worse, might damage the structure of your teeth. “My feeling is to use the simplest ingredient that does what you want it to do. Fluoride toothpaste does what we want it to do. It cleans the teeth, it doesn’t have a number of different additives,” he said. As for non-charcoal whitening toothpastes, Chase said while they generally work because they’re somewhat abrasive (like charcoal), the product probably isn’t in contact with teeth long enough for the active ingredient to do anything drastic. If you are looking to whiten your teeth, the best thing to do is talk to your dentist about the best method for you. And when you’re looking for products to take care of your mouth at home, Chase advised looking for the ADA Seal of Acceptance. “I think that stamp of approval means something,” he said.